Rosh Hashana 5779, Shana Tova! Summer flew by and now we are preparing for the holidays. Round challah, apples, honey, special new fruits, time for reflection, family and more are some of the ways we welcome the new year at home. Sunday night will be Erev Rosh Hashana, services will begin at 6PM. On Monday, Rosh Hashana morning services start at 9:30AM, concluding at 12:30PM, after-which we will join together at Owen Park for Tashlich. We will start the children’s services at 10:15AM, but the children are always welcome to come and join us before and after for crafts projects, discussions, stories etc. On Tuesday services will begin at 9:30AM, followed by lunch. Kol Nidre Services are Tuesday, September 18th at 6:30PM. Yom Kippur: Wednesday, September 19, 2018 services start at 9:30AM until 12:45PM. Children’s service same schedule as Rosh Hashana day one. Yom Kippur Afternoon: Meditation 3:30PM-4:30PM; Yizkor Service will start promptly at 4:45PM (please arrive 4:30PM); Afternoon service: 5:20PM-6:25PM; Ne’ila Service 6:25PM-7:25PM; Shofar blast and Havdalah 7:26PM followed by a community (dairy) potluck break the fast (bagels and cream cheese provided), please bring a dish to share. SOUP IN THE SUKKAH (5:30PM) potluck please bring a vegetarian soup, salad or casserole to share. For the second summer, MVHC will partner with Island Grown Initiative to serve summer lunches to children (& adults). We will be serving the English Language Learner Program at the Tisbury School. They anticipate that we will serve approximately 70 lunches each time. 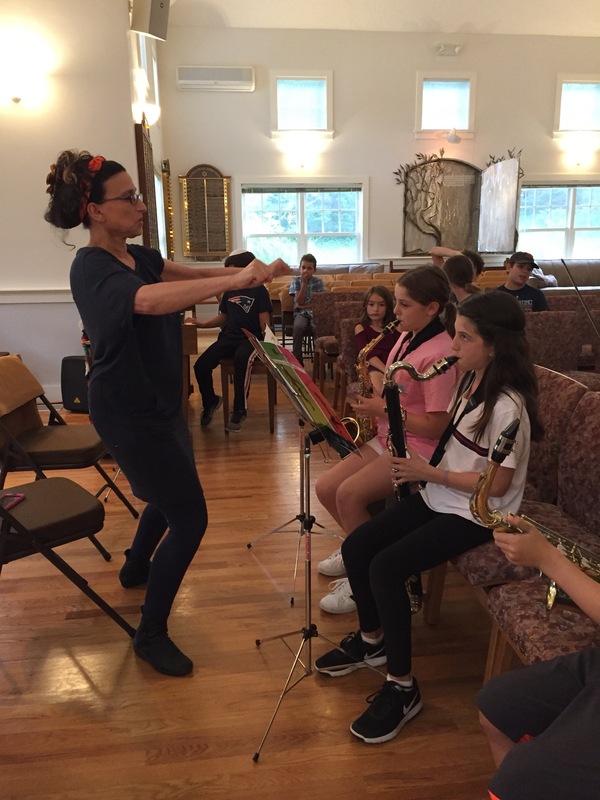 Please consider helping fulfill this mitzvah! We will need two volunteers per shift – 11:45AM – 12:50PM on the following dates: (on dates with an asterisk we must pick the food up from MVRHS and return the coolers there after food is served). Call a friend or family member and take a shift (or 2)! If you are able to take any shift(s), please contact me by email: lsh7041@gmail.com. This coming weekend, 95 island students will be going to Washington DC for the March for Our Lives demonstration. Our (wonderful) students made signs in support of the trip, see photo below. Please remember that if you plan to attend the community Seder at the Hebrew center you must register immediately (508-693-0745). It will be on Saturday night, March 31st. This year the MVHC is also hosting an innovative event, a special Freedom Seder marking the 50th anniversary of the assassination of Dr. Martin Luther King. That will be on Wednesday, April 4th at 7:30pm in conjunction with the Congregational Church of West Tisbury. It is a Passover Seder, but addressing contemporary freedom struggles. It is free of charge, desserts will be served – not dinner; please call the office to make a reservation (508-693-0745). There is no Hebrew school on April 4 (Passover). Friday 5/4 Tzium – end of school year dinner (potluck). Today the “older” students wrote letters of support to students in Parkland, Florida. Two of the letters are below. We had a productive discussion, and the students showed deep empathy for the victims and the survivors. Also, here are pictures of our fourth and fifth graders in nail biting round of “Jewpardy” about Purim (team names: Haman Haters and Shalom Smashers). As you know, Purim is during school vacation; we will not be having our usual (amazing) carnival, shows and hamantachen. However, everyone can participate in the mitzvah of mishloach manot by donating food to the island food pantry; we have a box in the foyer of the MVHC and there are boxes in the public schools and libraries. If you will be here, or traveling, I wish you a safe and happy school vacation week and look forward to seeing you next month. HAPPY PURIM FROM THE CREW – shown in costume from previous Purim. Tonight at 5! Please join us! & Friday 5:30PM! Also… nightly, starting tomorrow, 12/12 at 5:30PM and every holiday night after, at the MVHC there will be an outdoor Menorah lighting! Spread the word! Spread the light! On Monday 12/11/17 at 5PM, the Martha’s Vineyard Museum will debut an exhibition of Nancy Salon’s dreidel collection! Please make every effort to come! Friday 12/15 at 5:30PM MVHC Chanukah celebration- lights, music, latkes! This coming Saturday, September 30th is Yom Kippur; services begin at 9:30AM. Kol Nidre will begin at 6PM on Friday. This Holiday is an integral part of the Jewish year; please make every effort to attend. As you know, it is a tradition in our Shul to dress in all white and refrain from wearing leather shoes (or otherwise). A big thank you to Deborah Strauss for working with our students at school and at the holidays! 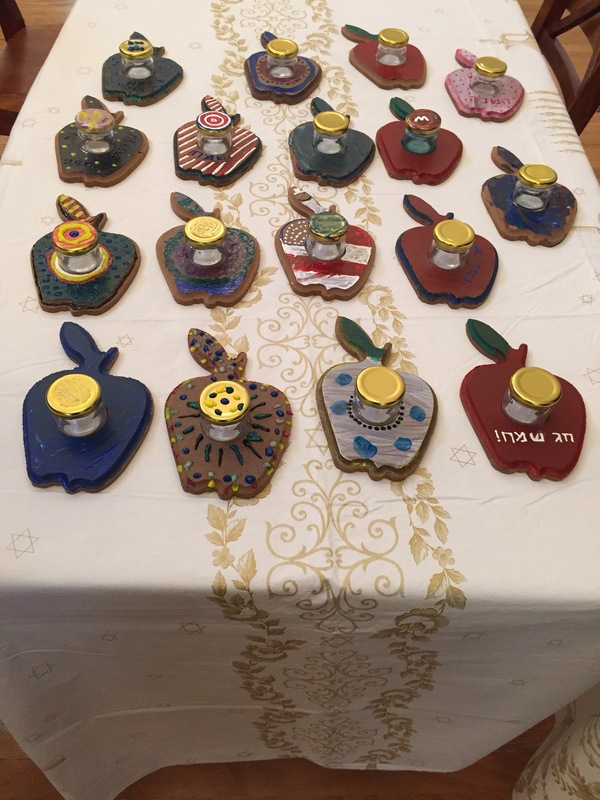 Rosh Hashana crafts project – Honey jars with decorated bases. mvhcschool's Blog Create a free website or blog at WordPress.com.